Young men of â€˜immigrant originâ€™, mainly black and North African have taken to the streets. They have burnt cars, buses and schools. They have vandalised a police station, factories and churches. Police officers have been injured with shot guns and Molotov cocktails. Anger quickly ignited in the poor suburbs that surround the capital. By the eleventh night, there was a veritable uprising raging across France. The wave of anger was triggered by the deaths of two young men, electrocuted as they hid in a power substation in the Parisian suburb of Clichy-sous-bois. A third teenager who survived by running away claimed that the three were hiding after being pursued by the police. The police claims that the young men were mistaken and deny any link between their deaths and the ensuing violence. The police’s denial encapsulates the problem – an inability to go to the heart of the matter. This denial encapsulates the problem that this wave of violence uncovers. So focused on buzz words such as integration and social cohesion, the alleged antidotes to the problems of the â€˜disadvantaged areasâ€™, there is a widespread inability in France to go to the heart of the matter. The interior minister, Nicolas Sarkozy, well-known and admired (if not always liked) for his politics of zero tolerance, proposes a crackdown on the violence, and harsh treatment for its perpetrators. Some argue that, on the contrary, it is necessary to change the image people have of the banlieues as no-go areas and to give those who live there a sense of local pride. Others more radically propose that the root of the violence is the exclusion of young black and Arab people from French society, the high levels of unemployment, the ensuing poverty and the police harassment that they are confronted with as a matter of course. Not the violence is the surprise – the long silence is. The violence should not come as a surprise. 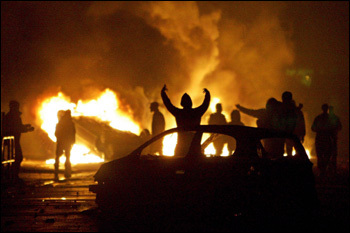 Several commentators have spoken of Franceâ€™s impoverished ghettoes as ticking time bombs waiting to explode. What is striking however is the relative silence with which the eruption is being met. President Jacques Chirac waited ten days before making a statement, while Nicolas Sarkozyâ€™s promise to clean the suburbs of â€˜scumâ€™ inflamed the riotersâ€™ anger and was quickly hushed-up by the administration. Television chat shows on the topic have presented a one-sided view of the rioters as bored youth with nothing better to do than destroy everything in sight. Guests decry the absence of parental control and the restraint reaction of the police. The most echoing silence of all is that of the left-wing, anti-racist and human rights organisations. Quick to descend to the streets to demonstrate in support of the Palestinian Intifada or against the occupation of Iraq, they have kept total silence on the home-grown â€˜resistance movementâ€™ which is taking its first steps across the concrete jungles. This response should not surprise anyone with an understanding of Franceâ€™s history of post-colonial immigration and the republican model of integration it has attempted to impose. Franceâ€™s political culture makes it impossible for anyone who does not completely embrace the values of the Republic to access the public sphere: foreign residents were not even legally permitted to establish associations in France until 1981. The problem is that defenders of human rights and anti-racists tend to belong to that very French group of â€˜intellectualsâ€™ whose lives in the affluent centres rarely coincide with those in the distant banlieues. There is a belief, instilled in France through the public education system, that the values of liberty, equality and fraternity are universally accessible through a commonly applied principle of meritocracy. Those who fail to find a place in this system are professing anti-republican values such as the much dreaded communautarisme of which Franceâ€™s religious Muslims (but not Christians or Jews) are accused. The uprising of the suburban youth may be haphazard and unpleasant – but it is not apolitical. What both the Right and the Left in France are therefore unable to see is that the uprising of the suburban youth, haphazard and unpleasant as it may be, is not apolitical. It is not, as one commentator has claimed, a battle between gangs in different suburbs competing to create the most havoc. 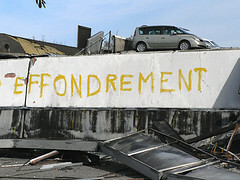 The rioters have a declared aim: the removal of Nicolas Sarkozy. Their action mirrors the uprisings that swept through the black ghettoes of the United States in the 60s and 70s and those of Brixton and Toxteth among others in 1980s Britain. The rioters then and now protest against the heavy handed policing of poor, non-white people in neighbourhoods that have become no manâ€™s lands, severed from the centres of political, cultural and economic life. The reason that the French political arena cannot explain or propose solutions to the deep seated problems unveiled by the rioters is that it is incapable of listening to their grievances. They are either in the clutches of radical Islam or hooligans looking for a fight. The political myths of secularism and the rule of law at the base of French political culture make it impossible to think politically about the actions of those who reject both. Many young people of immigrant origin reject secularist ideology because it clearly discriminates against Islam specifically: culturally, the French state is still clearly Catholic. Neither does the rule of law command any respect when it is mainly experienced as oppressive policing based on a system of racial profiling that targets young black and North African men. The rioting symbolically tramples on these lofty principles and begs a response. By responding by imposing a curfew, Franceâ€™s answer is clearly that these young men are the â€˜enemy withinâ€™ they always suspected they were considered to be. History has been abruptly recalled: the government is remobilising a 1955 law brought in to impose curfews on the Algerian shanty towns of France during the War of Independence. France must accept that the anger of the descendents of non-white immigrants is also for their fathers and grandfathers. The malaise at the heart of the suburbs will not be rectified, as has been proposed over recent days, by an acceptance of cultural diversity or the injection of more cash into the banlieues alone. France, like all multicultural post-colonial societies, must accept and redress the institutionalisation of racist discrimination within its political, social and economic structures. It must accept that the anger of the descendents of non-white immigrants is also for their fathers and grandfathers, housed in makeshift shanty towns while they rebuilt a war torn France. They live with the legacy of Algeria and the penance that North African immigrants are still doing for Franceâ€™s defeat there. The suggested carrot and stick policy is doomed to fail like it always has. If anything is to change, listen to the message in the ashes of the cars. They will not be appeased by the promise of the right to vote in local elections or the building of Mosques and the funding of Muslim schools. While many, even towards the left of the political spectrum, have been encouraged by these proposals, put forward by Sarkozy with a view on the presidency, the rioters know that they will change nothing. Such a carrot and stick policy is doomed to fail because it infantilises and depoliticises their action. If anything is to change in France, it is the political message written in the ashes of the burnt out cars that must be listened to. It says that integration cannot be one-sided. Society must change in order to reflect the realities of the population as a whole, and not just the ideals which myths such as the â€˜universal brotherhood of manâ€™ have been created to artificially sustain. After all that very ideal was the basis for a revolution that happened in France. Maybe now itâ€™s time for another! With the upcoming 2007 presidential elections, the battle for the youth vote in France heats up, BBC reports. BBC has added an excellent report on the current situation in the banlieues. 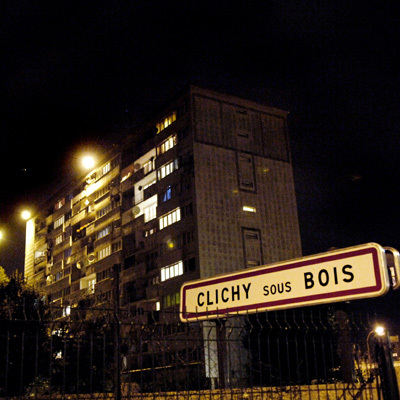 They also revisit Clichy-sous-bois – and it is striking to see how little the government has done since the uprising often vilified as riots — and how well the media captures this fact. We have written about the protests in France before here and here.